The reverse of the bunting is silver with a sparkle finish. 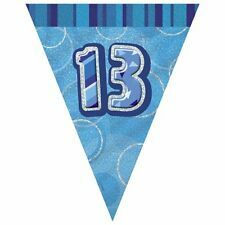 Each flag has a prismatic foil design in shades of blues giving a glittered effect surrounding a central number 13. More than just a banner - A decoration all in itself ! Suitable for male or female. This brightly coloured foil banner reads :Happy 18th surrounded by dots. Greater impact is given by the banner being extra wide. Ideal for parties - make an impact with this decoration! 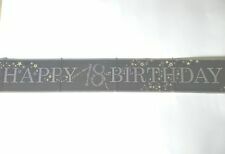 A great 12ft long foil banner for an anniversary celebration or party. Happy Anniversary Foil Banner - 12ft long. 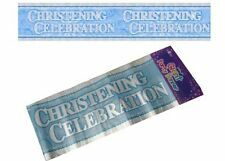 This brightly coloured foil banner is decorated with hearts & the wording:Happy Anniversary. White & Silver Happy Anniversary Foil Banner - 9Ft Long. A great foil banner to celebrate an anniversary. The banner has the wording:Happy Anniversary in silver on a white background & decorated with a design of hearts & stars & the bottom is also edged with a border decorated with hearts & stars. The reverse of the bunting is silver with a sparkle finish. Each flag has a holographic bubble design in shades of blues with white & silver giving a glittered effect surrounding t he wording 40th. A 13 ft length of 10 triangular pennant flags in the new Blue Sparkle design. 50th Wedding / Golden Anniversary Foil Banner - 9Ft Long. A great foil banner to celebrate a 50th golden wedding anniversary. The banner has the wording:Golden Anniversary in gold on a white background & decorated with a design of hearts, 50's & stars & the bottom is also edged with a gold border decorated with hearts & stars. The reverse of the bunting is silver with a sparkle finish. Each flag has a prismatic foil design in shades of blues giving a glittered effect surrounding a central number 16. Ideal for parties - make an impact with this decoration! The deluxe embossed foil garland consists of age 60's alternating with foil balloons embossed with stars. The balloons have silver foil swirls dangling beneath them. 10 Ft /3M Length. The reverse of the bunting is silver with a sparkle finish. Each flag has a prismatic foil design in black & silver with a glittered effect surrounding a central number 90. Design repeated along the length of the banner. Ideal for parties - make an impact with this decoration! Give your party that finishing touch! A great set of 3 multi-coloured Just Married holographic foil banners for your celebrations. The brightly coloured foil banners each read:Just Married & are decorated in a multi-coloured design. The reverse of the bunting is silver with a sparkle finish. Each flag has a prismatic foil design in black & silver with a glittered effect surrounding a central number 30. A 9ft long cute Christening foil banner in the new Sweet Elephant range for a little girl's Christening celebration. 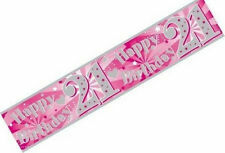 On Your Christening Girl's Cute Elephant Design Pink & White Foil Banner Decoration - 9ft Long. The reverse of the bunting is silver with a sparkle finish. Each flag has a prismatic foil design in shades of pinks giving a glittered effect surrounding a central number 4 0.